The 2012 Topps Finest Football Robert Griffin III Superfractor Autograph has surfaced on eBay. The seller has a Buy It Now price of $7,500 posted but is also accepting offers. The one-of-one card is a rookie variation autograph. The listing is scheduled to end on Saturday, September 1 at about 8 AM EST (5 AM PST). However, because there is no bidding involved, collectors can buy it outright or make offers at any time. The seller is based out of Texas and pulled the card at Kenny's Collectibles in Austin. He has a strong feedback rating without any negatives in the last year. 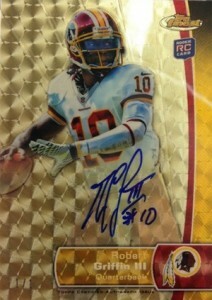 While this pull is huge, RG3 fans don't necessarily need to stop chasing 2012 Topps Finest Football. This is not the only Robert Griffin III Superfractor available in the product. In fact, he has several. Others include an Autographed Patch Superfractor, an Autographed Jumbo Patch Superfractor, a couple of different Dual Autograph Dual Relic Superfractors, a Finest Moments Autograph Superfractor and a die-cut Finest Atomic Rookie Superfractor. Superfractors are widely considered among the best cards in the hobby, especially for rookie cards. This particular card features an on-card autograph. Because it's a Superfractor of Griffin's rookie, it will likely be more iconic an desirable in the long-run than the other Superfractors available in the product. Other 2012 Topps Finest Football Superfractors currently listed on eBay include a Ryan Tannehill Finest Moments Autograph, a Trent Richardson Finest Moment Autograph, a Rueben Randle autograph, and a Kendall Wright autographed jumbo patch. Update: 8/29/12 The seller accepted a bid of $3,100. Not sure if I should sell it or keep it. steve worgan (ID 87316) � Congrats on an awesome pull! It’s a tough decision to sell or not. What are the goals of your collection? If you simply want an Andrew Luck autograph, you could sell it, buy a cheaper autographed card and have some extra for other stuff. Because it’s a Superfractor of an insert, it won’t be quite as popular as base versions. But a 1/1 Andrew Luck is still a 1/1 Andrew Luck. If you opt to sell on eBay, you can post it in the forums (http://community.cardboardconnection.com/forums/forums.php) and help other collectors find it as well. I had a friend post it on E bay and will post a thread in the forum. Again, thanks for the great advice.